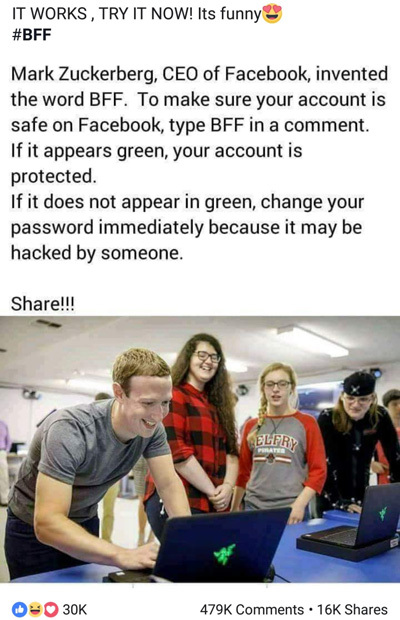 A Facebook status meme is going around Facebook claiming that if you type ‘BFF’ and it turns green, it means that your Facebook account is protected and safe from hacking. I recently encountered this meme in my Facebook news feed and I thought that it was some belated April Fool’s joke. Then I realized that some Facebook users take it seriously. So I performed some fact-checking and research to determine if the claim is true. Online fact-checking website Snopes says that the claim is false. Having a green ‘BFF’ comment is not related to your account security in any way. A green ‘BFF’ doesn’t indicate that your Facebook account is secure and protected from hackers. A non-green ‘BFF’ also doesn’t mean that your Facebook account is unsafe or vulnerable to hacking. Now, Facebook is updating the list of words that triggers these animations. Additions include: “rad,” “bff,” “lmao,” and “thank you so much.” All of those words will now come with their own colors and animation effects. So typing the word “BFF” does indeed trigger an animation, turning the word green, but it does not mean that your Facebook account is protected. It’s due to your browser settings and has nothing to do with your account security. Facebook has already taken action against fake news, but it seems that it has no interest blocking this annoying meme from spamming my Facebook news feed. As you can see on the screenshot above, thousands of Facebook users have commented on and shared this meme and its numerous variations. The best way to secure your Facebook account is to use a complex password and to turn on two-factor authentication in your Security and Login settings. In any case, it’s a good idea to change your password every now and then. Facebook will alert you if your new password is too short or too weak.